That made me wonder: When was the last time U.S. horse cavalry—I am obliged to say “horse cavalry” because today there are cavalry units with tanks or airplanes taking the place of horses--charged into battle? The answer turns out to be Jan. 16, 1942, during a retreat by the 26th Cavalry Regiment to the Bataan peninsula preceding the surrender of U.S. forces in the Philippines to the Japanese army. The charge was led by Lt. Edwin Price Ramsey. Ramsey would say afterwards that he never really expected to survive the war. "It was a very difficult war," he said, "and I don’t know that I had constantly committed myself to the grave, but I knew that the odds were against my making it." As it happens, Ramsey uttered those words this afternoon. He was speaking to me by telephone from Los Angeles. He is 95 years old, and, as best I could tell by phone, he's in terrific shape. Ramsey watched the presidential debate last night, and, yes, he noticed Obama's remark. He and his wife are both voting for Romney. (I hope I haven't just committed him to appearing in a Romney ad.) It doesn't actually have anything to do with what Obama said about horses. Even in 1942, Ramsey concedes, horse cavalry were a rarity. "They weren’t obsolete," Ramsey says, "but there were very few of them. The Russians had some. The Poles in Europe, they still had some horse cavalry. As far as ours was concerned, so far as I know or remember, the 26th Cavalry, which [consisted of] Philippine scouts, was one of the last cavalry regiments." But you want to hear about that last cavalry charge. Over the rattling gunfire I ordered my troopers to deploy as foragers, and I raised my pistol. A charge would be our only hope to break up the body of the Japanese troops and to survive against their superior numbers. For centuries the shock of a mounted charge had proved irresistible; now the circumstances and all my training made it instinctual. I brought my arm down and yelled to the men to charge. Bent nearly prone across the horses’ necks, we flung ourselves at the Japanese advance, pistols firing full into their startled faces. A few returned our fire, but most fled in confusion, some wading back into the river, others running madly for the swamps. To them we must have seemed a vision from another century, wild-eyed horses pounding headlong; cheering, whooping men firing from the saddles. As I rounded the corner of a church, I saw a riderless horse standing rigid a few feet away, a trooper beyond it firing into a hut. At that moment a mortar shell dropped in front of us, the animal taking the full force of the explosion. It reared up on its hind legs with a horrible scream, and I watched its belly peel open, the steaming contents slithering out, and then the horse crumbled onto its haunches in a hypnotic slow motion. Ramsey held Morong till he was relieved that afternoon, but eventually U.S. forces were overrun by the Japanese. When that happened, Ramsey went underground and fought in a guerrilla unit until the U.S. retook the Philippines in 1945. By that time, Ramsey says, he was leading "one of the largest [guerrilla forces] in the world." Horses didn’t play much of a military role after that. But lately they’ve had a small comeback among special forces in Afghanistan and other remote places. 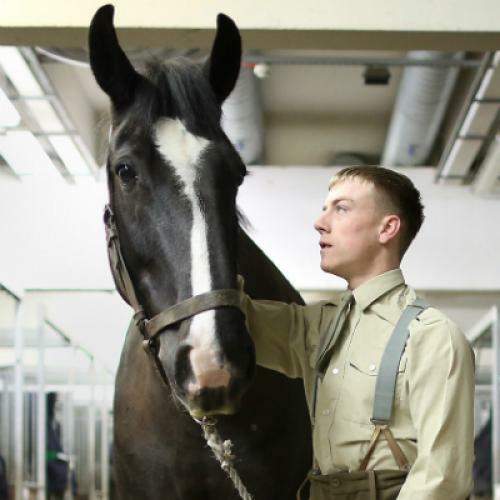 There’s even an Army manual about how to care for and ride them, along with other pack animals such as donkeys, mules, camels, llamas, and elephants. (Use of the latter is discouraged because they’re endangered and difficult to handle.) Much of the Army manual conveys information that was presumably once common knowledge--e.g., “Chaps are leather leggings worn to protect the legs while riding”—and even today I imagine Ann Romney would have little to learn from it. After 9/11, some special forces sent to Afghanistan to recruit rival warlords into the Northern Alliance ended up riding horseback with Afghan tribes into battle. “It really looked like something you envision in the Old Testament,” recalled retired Army Lt. Col. Max Bowers in a short video documentary. Some folks in the government--Ramsey can't remember who--contacted him afterward to tell him about it. It wasn’t, technically, another cavalry charge, but it was the closest anyone had come in about 60 years. But the president is essentially correct. That sort of thing doesn't come up very often.